The City of Kettering Parks, Recreation and Cultural Arts Department is delighted to share new opportunities to partner with us. Is your business or organization looking for new solutions to market to individuals or families that are active, health conscious, love outdoor activities in the local community? We have created a wide range of opportunities for you to reach your target audience, while supporting your community…together making a difference in our parks, recreation and cultural art spaces. We provide unique opportunities to promote your business or organization while also investing in your community. Download the Sponsorship Package (PDF). If you do not see a level that works for you, we can customize a sponsorship to meet your corporate or individual needs. Contact the Kettering Department of Parks, Recreation and Cultural Arts at 296-2454 to learn more. The City of Kettering preserves its right and discretion to exercise full editorial control over the placement, content, appearance, and wording for sponsorship affiliations and messages. 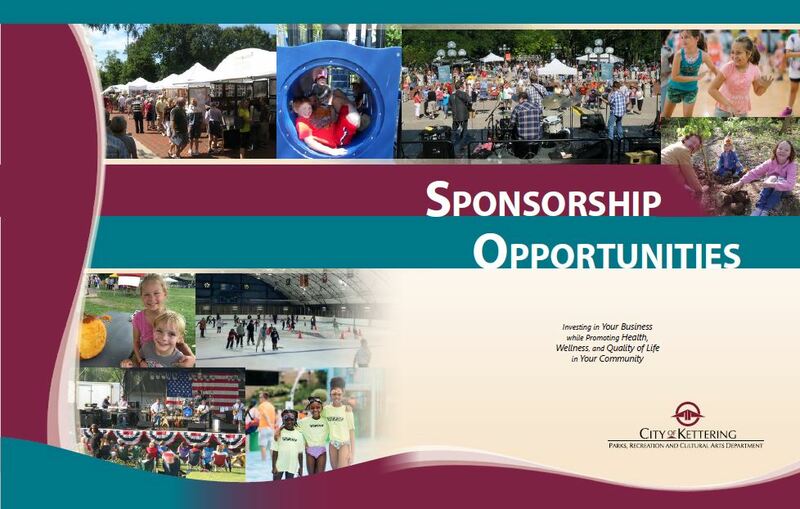 View the complete City of Kettering Sponsorship Guidelines (PDF).